Twitter is telling brands, "Come to us if you want to reach fans freely." The company said today that marketers can hit an audience equal in size to 30 percent of their followers in a given week with a consistent and free tweeting strategy. That level of free exposure contrasts with Facebook, where brands have to pay to be seen by more than 5 percent of their fans. "On Twitter, nothing comes between your tweets and your followers," the company said in a blog post today announcing new measurement tools for brands and verified users. Twitter is now sharing organic tweet analytics, detailing how many people actually see the messages marketers post freely and frequently on the network. These are the types of stats that Twitter already shares with advertisers when it comes to paid promoted tweets. Marketers will see how many impressions they rack up in real time, on what Web and mobile platforms, and how many retweets, replies and favorites. The measurements include how often the tweets get picked up in other online media and how often users outside of Twitter click on them. Despite its smaller audience of 257 million users compared to Facebook's 1.28 billion, one of the biggest draws for brands is how often Twitter messages are highlighted by other media, promoted on TV and online. Twitter said that brands that tweet two to three times a day connect with an audience that is equal to 30 percent of their follower base in a given week. The 30 percent figure was an average among 200 brands. 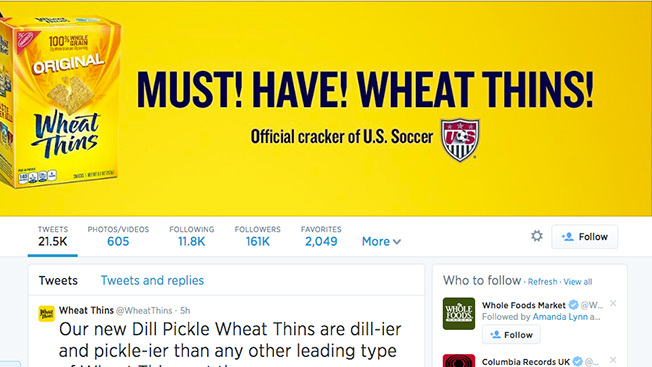 Wheat Thins reaches a Twitter audience that is equal to 95 percent of its 161,000 followers weekly, according to today's blog post. It also said that Trident Gum speaks to an audience five times the size of its follower base weekly. On Twitter, users receive all the messages from every account they follow, but there is no guarantee they will see a given post before newer ones quickly overtake and push out the old. The experience is the opposite of Facebook, where users see posts based on an algorithm that picks what is likely most interesting. Advertisers need paid promotion strategies for a more robust Facebook presence. Facebook defends its curated News Feed, saying it’s more targeted and less cluttered than the torrent typically found on Twitter.